I’d had my doubts about the recipe. It seemed to call for way too much sugar, it called for milk instead of cream. But, I had it in my head that we should have fresh vanilla pudding to go with our strawberries. I know, I know. There’s nothing wrong with ice cream or Greek yogurt (we didn’t have cream to whip) on berries; really, there’s nothing at all wrong with plain strawberries. But I felt like cooking something. I’d already made strawberry pie, didn’t feel like strawberry shortcake (and again, we didn’t have any cream). I felt like something different. I usually flip through three or four recipes when I haven’t made something in a while, to remind myself of the various techniques and/or ingredients involved, and then I either choose one or combine a few. But I was in a hurry to get it made and chilling in the fridge before I headed out on an errand, so I just embarked on the first recipe I found. I tossed the ingredients in a sauce pan and stood at the stove, stirring and stirring the only-slightly thickening mixture, checking the clock, needing to leave the house. I finally poured the soupy pudding into ramekins, set them in the fridge, and hoped for the best. In the event, I didn’t even need the butter. 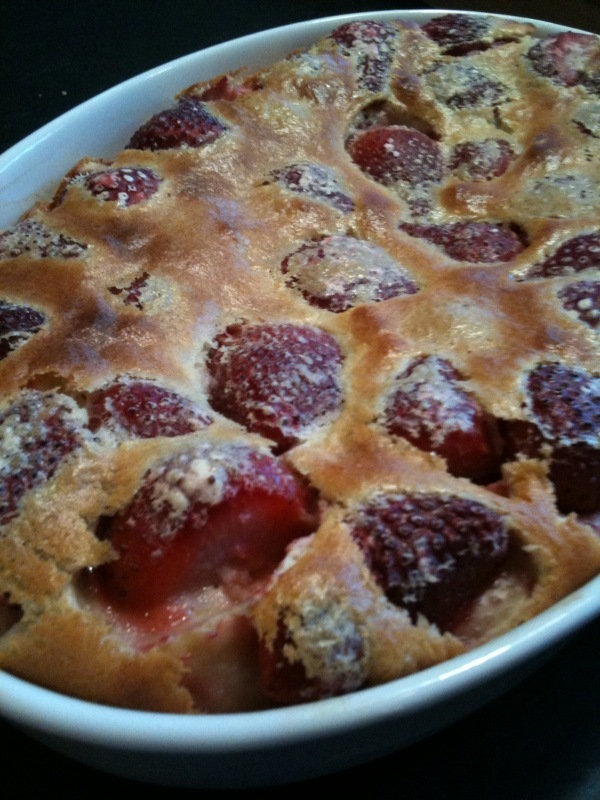 Clafouti is basically a pancake batter poured over fruit and baked until set. It tastes a bit like a fruity Yorkshire pudding. Traditionally it’s done with cherries, but strawberries were lovely, and raspberries or blueberries would be nice, too. It’s not something I’ve made before, but plenty of experience with pancakes, popovers, and Yorkshire pudding made me more confident than I was about the pudding. The recipe I used (from Sunset Magazine) couldn’t be simpler and, unlike the pudding recipe, it worked. The lesson for me here is not to never try new things (I’ll certainly try vanilla pudding again), but to slow down in the kitchen and to trust my instincts. We’re on kind of a pudding kick around here, having already enjoyed milk chocolate last week, and with butterscotch still to come, so I’ll try vanilla again, and post the recipe when I get it right. In the meantime, if anybody has suggestions for how to repurpose my too-sweet vanilla soup, I’m all ears.